Wow, where to begin with Bonaire. Originally, Element and her crew were to stay only 2 weeks in Bonaire but ended up staying for 90 days. This place has a way of infusing into your heart. So many interesting events and milestones occurred during our stay. Bonaire turned out to be a diamond in the rough (and one of my favourites). It ended up being our longest stop since we left Finike, Turkey in April 2016. Upon first glance Bonaire was nothing special but, upon spending time on land and in the water it has ingrained its way into my heart. It was the wee hours of the morning as we approached Bonaire from Los Roques, Venezuela and we had to slow down in order to arrive in day light. Once we were able to see, we slowly approached the mooring field. Back then it was so foreign. Funny how places become so familiar. During our first cruise by of the mooring field, we quickly spotted two friend boats, Manado and Gaia. We were unable to find a mooring near them so we continued on. In fact there were no moorings available until, a lady on a catamaran waved at us. I was nervous that we were going to be told bad news but were thrilled to find out that their vessel was departing and that we could have their spot. The rest is history. As we were grabbing the mooring a Norwegian boat, Kattami in front of us knew who we were. Element's name preceded us as we are a kid boat. Not really, the s/v Manado crew had mentioned that we would be arriving soon. It was lovely to get to know Ragnar, Thea, Veslmøy and Hedda during their time in Bonaire. We also got to meet another kid boat, Nomad. They have three children (Amos, Noah and Addie). They have a small dinghy sailboat and Jordan got to sail around with Amos. It was so lovely to see. The first time we jumped off the stern, we were greeted to our own personal aquarium. To say incredible does not describe it accurately, in fact I had to use a thesaurus to find an accurate word. Staggering! Yes, this will do. Staggering amounts of fish at our doorstep. In fact one evening we were all heading in to Luciano's (our favourite ice cream and wifi joint) and we drove the dinghy through a school of flying fish. I can only describe it as driving through a wall of fish. I was slapped in the face while the girls were slapped on their arms. Three landed in the dinghy flapping and thrashing. It was hilarious! A memory that will be with me forever! Each day we would snorkel a small reef in the shallows becoming familiar with its residents. Paige was so sparked by the creatures that she mapped the shallows. During her mapping she found where several octopuses resided, eels, shrimp, french angel fish, tarpons and many more creatures. Incredible! As we watched her interest bloom, we decided that this was an exceptional opportunity for her to get her scuba certification. 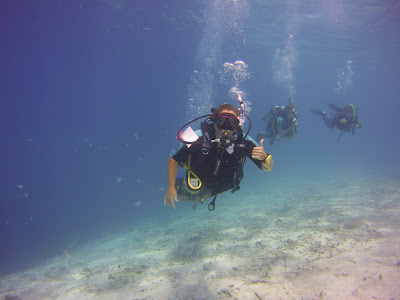 So, as an early birthday gift we sent her to Dive Friends Bonaire for her certification (milestone 1). I was one proud mom. During one of our visits with our good friends Nadja and Manuel (s.v Manado), a huge decision was made. They decided to sell their boat and come and live on Element. We had tossed the idea around a while ago as we wanted extra hands for our Pacific passage. We wanted the right fit and Nadja and Manuel were just that. The date was set for November 12 that our new crew would move aboard (milestone 2). During our time in Bonaire we had several celebrations. Shaun's 46th birthday, Jordan's 8th birthday, Paige's 14th birthday and a Halloween to remember (pictures on the next blog post). All of these occasions were enjoyed with fellow cruisers, new friends as well as old friends. For Paige's birthday I wanted to try and make it special. I organised a surprise party. I could not have pulled it off without the help of my good friends on s/v Maple. Janet offered to make a cake and I invited the kid boats we knew along with our friends from Windancer VI. Paige had no idea (or she claimed to have no idea). Either way a win! 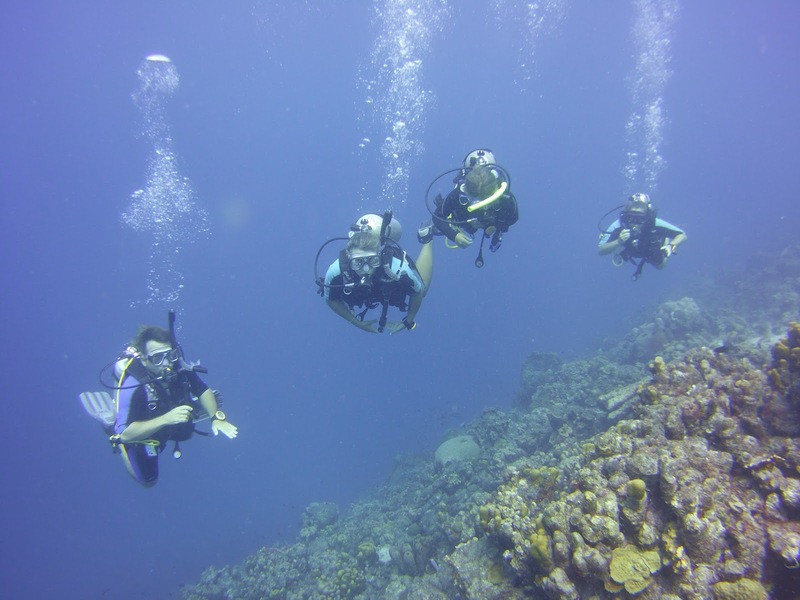 I was eagerly awaiting our friends on s/v Maple to arrive at the end of August and as soon as they arrived we organised (thanks to Nadja and Manuel) an awesome price for PADI certification. Literally, 3-4 days after Maple arrived we were in the water getting certified. There is a lot of reading material to cover in 2-3 days but we managed to get through it before the in the water training began. We were all certified together early September (milestone 3). By the time we departed Bonaire I had 16 dives under my belt while Paige had 15. 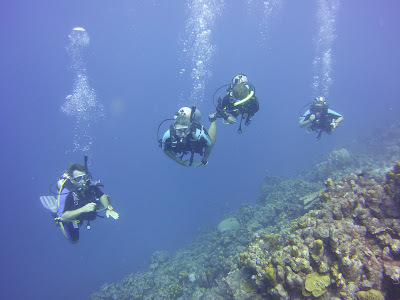 Helping us with our diving experiences was our friends on Ad Astra. Most Sundays they invited friends and fellow divers out to different dive sights for the entire day. In fact, I successfully completed my first night dive at the Salt Pier (milestone 4) during one of these outings. continued to read in my next post Bonaire part 2.